I saw this idea on Pinterest and I thought it was absolutely perfect for Halloween! I used cheddar cheese because that is what Chicken Legs prefers, but feel free to use any cheese you like. It was so much fun to carve out the faces for these burgers. 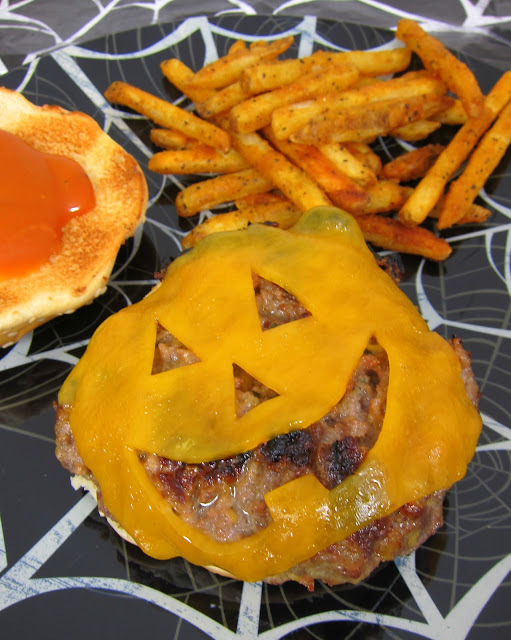 These burgers would be perfect for a Halloween get together or dinner for your little ghost and goblins after trick-or-treating. 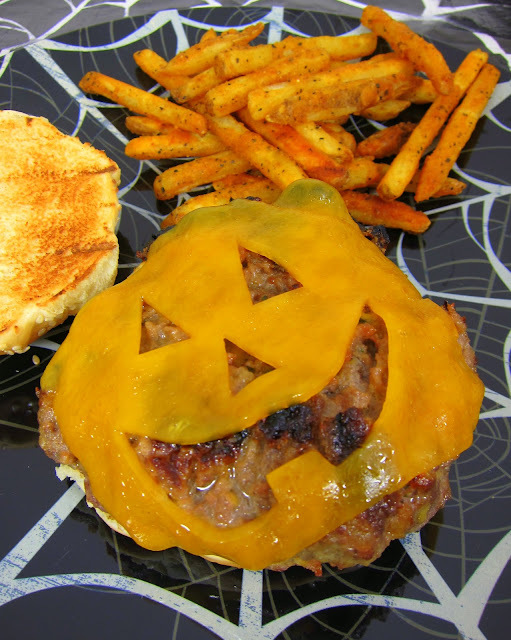 If you don't want to make burgers, this cheese cut out would also be fun on cheese toast for Halloween morning! In a large bowl, combine hamburger, sausage and Ranch mix. Shape into 4 patties. Grill, broil or pan-fry until the meat is no longer pink. Cut out jack-o-lantern eyes, nose and mouth out of each cheese slice. Place cheese on burgers; cook until cheese is slightly melted, about 1 minute. Serve on toasted hamburger buns. haha, I've never had a hamburger that was staring at me like that! I've been making your recipes everyday this week and I haven't been disappointed yet! They're all super easy and great tasting. Huge hit with my family. LOVE YOUR BLOG!!! Can't wait to try this recipe and thank you for sharing! The Martineau Family - the fries are Checkers/Rallys brand. I got them at Wal-Mart.